This recipe was taken from my new Cookbook, Comforting Eats, due out tomorrow, November 12th (eBook) and spiral version will be ready mid December! For more details and a chance to win 1 out of 5 eBooks, check out THIS blog post! 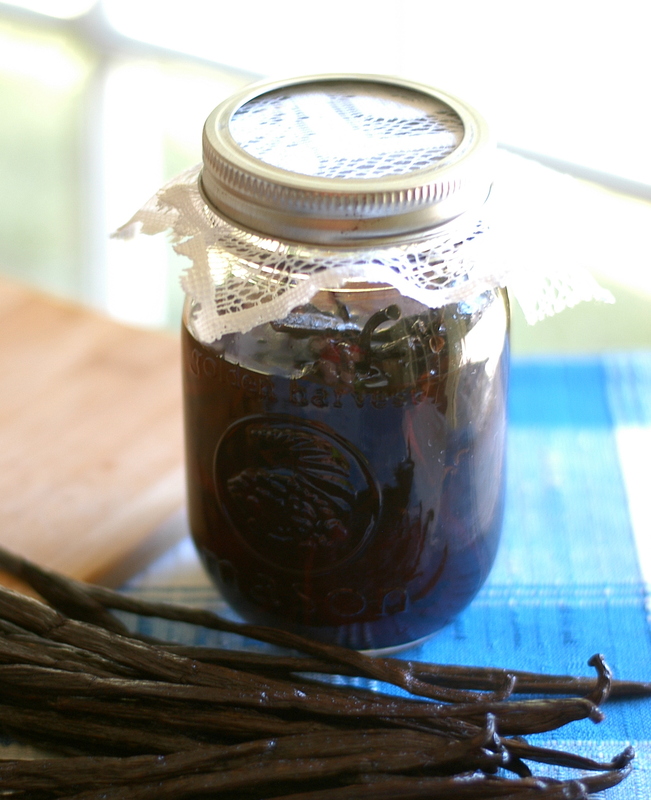 The gift that keeps on giving, Homemade Vanilla Extract! A few months ago I FINALLY made my own vanilla extract, and I am kicking myself why I haven’t made sooner! A friend had given me 3 bottles of vanilla extracts, each using vanilla beans from different regions. She presented it in a beautiful box, with each bottle clearly labeled with the type of vanilla bean used as well as a printed insert with more information about the region of origin for each type of bean. It was wonderful!! Unfortunately, as much as I use vanilla, it didn’t last long so it was time to start making it myself! Two months ago, nothing but vodka and vanilla beans. I patiently (well, not really) waited for my extract to brew…. 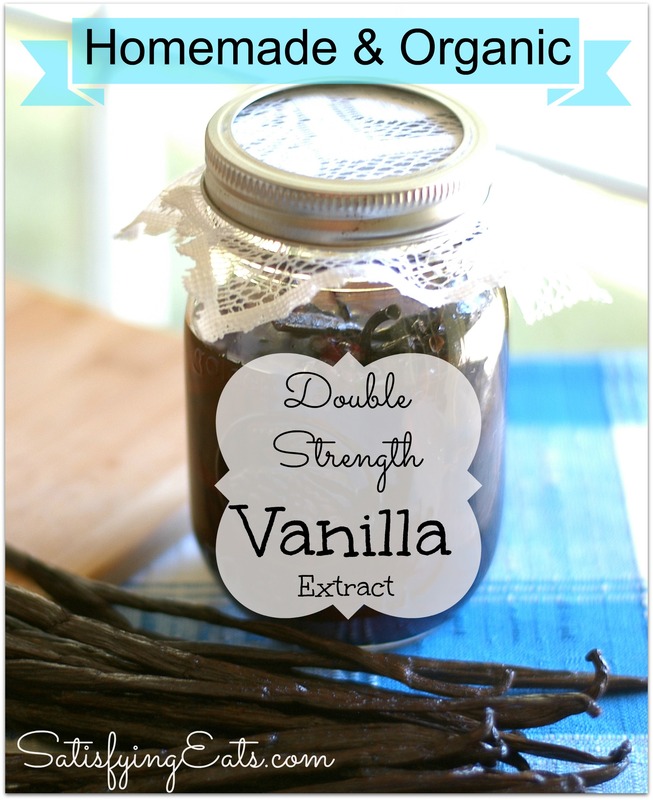 Two months later, I am using my yummy, Double Strength Vanilla Extract! Please, whatever you do, DO NOT purchase imitation vanilla extract…PLEASE!! There is no telling how many chemicals were used to create the vanilla “flavor” and your baked goods will not taste as good, guaranteed! Also, be very leery of the $10 bottles of “Mexican Vanilla” that someone brings back from their cruise. It’s probably not even vanilla! Some of the vanilla extracts in the store also contain corn syrup! What!?!? READ the labels! I used to buy the 16 oz McCormick Vanilla Extract which didn’t contain the corn syrup but there smaller bottles did. Makes no sense to me other than it is best to make your own and it’s so EASY! If you must buy some, THIS kind is best, but I admit, it is VERY expensive! As most of you may know, I am not a drinker, but when it comes to cooking and baking, I LOVE to use different alcohols to flavor dishes…. like gluten-free beer in my Adobo Chicken or red wine in my Pot Roast. Also, white wine in my cream sauce for my Shrimp Alfredo and of course, Marsala wine in my Tirimisu. Well here is another use of alcohol other than drinking. Vodka is vehicle of choice when making homemade extracts. Something that is 80 proof, you DEFINITELY don’t have to worry about anything growing in bottle. 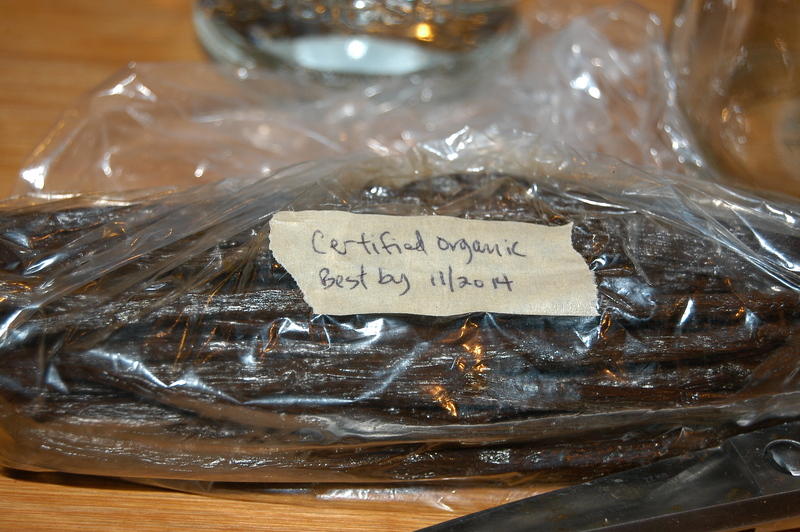 Vodka has the least amount of “flavor” so it is pretty neutral once the vanilla beans have been infused into it. You can also use bourbon if you don’t mind the flavor. Honestly, you can use any vodka but many will tell you, the higher quality, the better your vanilla extract will be. If you can find it, search out an organic and gluten-free brand (click HERE for gluten-free brands). You also want to seek out organic beans. These can be found online. Here are some on Amazon. The beans I used came from a local co-op so I got them for a pretty good price. Note: Calculations are based on there being 25 beans per 1/4 lb but there are usually more beans (depending on plumpness) so the price per bean is actually cheaper than listed. 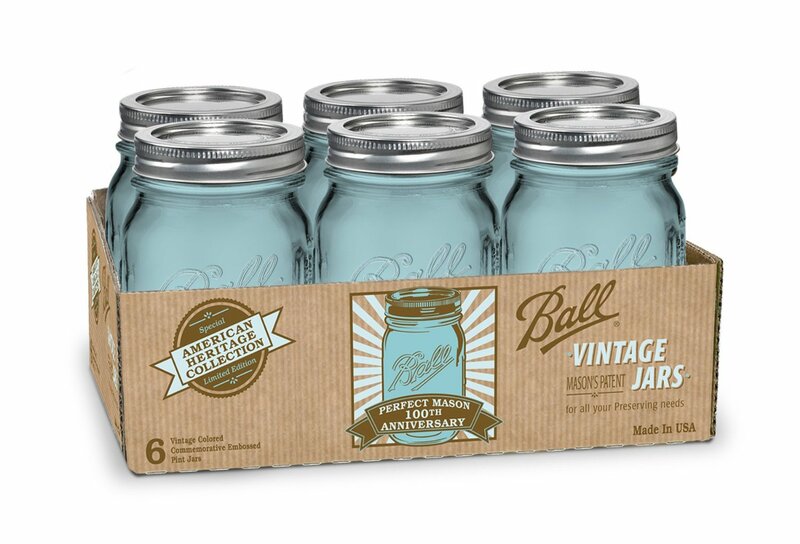 Purchase Vintage Ball Jars HERE. I have experimented with different size and types of jars and I actually prefer the pint size jars for making or “brewing” the extract. This give me room to actually remove some of the beans to “transplant” to bottles that I will give as gifts. When giving as gifts these smaller bottles work well and be sure to put some of the cut vanilla beans in the recipients jar so that they can continue to create more extract. The bottle of vanilla extract that I received as a gift. I LOVE the personalized labels! As you can see, making homemade vanilla extract is super easy and everyone will LOVE to receive small bottles of extracts as gifts. Using kitchen scissors, split the beans lengthwise and then in half. Place beans inside clean pint jar. Pour vodka over beans. Be sure the beans are completely submerged under vodka. Place lid on jar and store in pantry. agitate the bottles once a week. Extract will be ready to use in about 6 weeks the longer it sits, the stronger the extract becomes. As extract is used, replace with more vodka. *Use this extract spoon for spoon in recipes calling for vanilla extract. 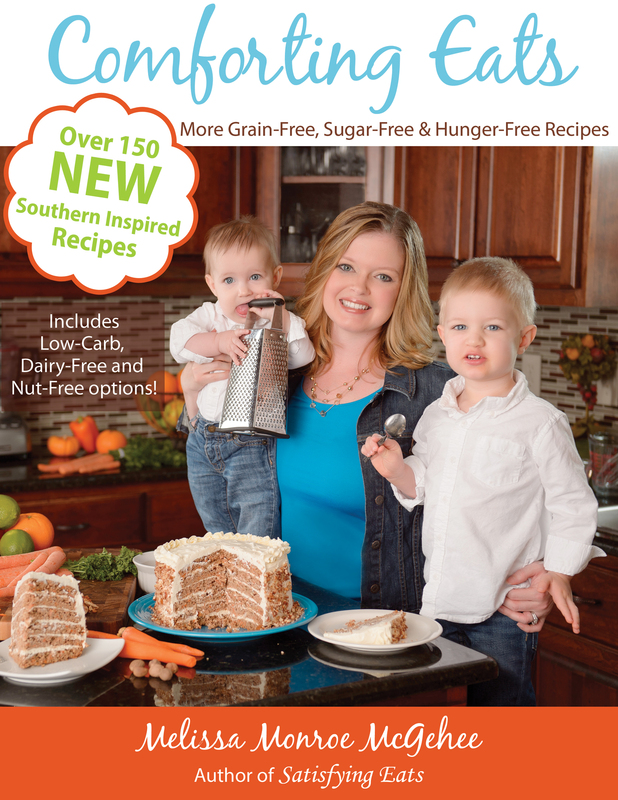 « Comforting Eats eBook Giveaway! This may be a silly question, but when you use the vanilla and replace with more vodka, how long do you wait for it to be ready again? If it takes 6 weeks for the original batch to be ready, how long must you wait once you add fresh vodka again? I’ve never made this before, but I just love the thought of doing it for Christmas gifts this year! 🙂 Thank you! JoEllen, there is really no rule but you can tell it is ready by the color. I even used it when it was not ready and it was good. It is probably good to have 2 bottles going, use one up and then replace the vodka and then use the other bottle while the 2nd bottle is brewing. Hope this helps and Yes, it would be perfect for Christmas! 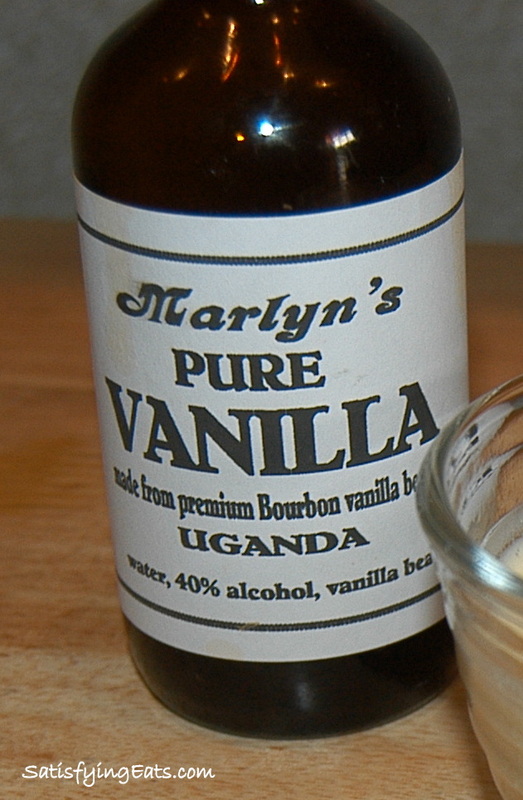 Hi, this is quite a silly question but I do not drink due to religion so I have never really paid attention to where to buy alcohol… I want to make vanilla extract (because honestly it is just too expensive store bought!) but I have no idea where to find vodka or bourbon whiskey. My local wholefoods representative said I would need to go to a specialty store for the bourbon but I was wondering if that is the case for vodka as well? Also how much do bourbon whiskey and vodka run? Thanks! April, you can vodka or bourbon at most grocery stores, brands will vary based on your region. I am not a drinker myself but I do LOVE using it to cook. I hope this helps and keep me posted! Melissa, hate to contradict you, but she will likely find vodka or bourbon in a grocery store only in Louisiana! I know that’s where you are from and you are probably used to seeing liquor sold at your usual grocery and convenience stores. But most states only sell liquor at a liquor store! 🙂 You are forgetting you live in the party state! You are awesome – love all your recipes! Lol, true JT! Thanks so much! 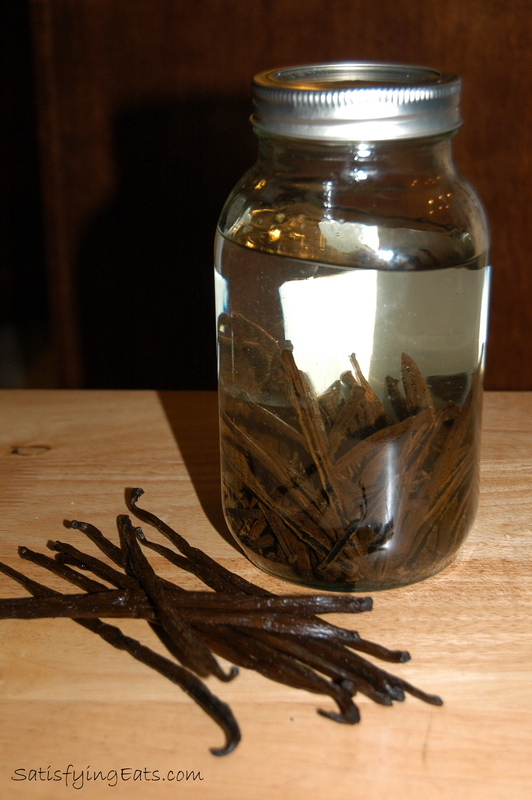 How many times can you replace the vodka before the vanilla beans are spent – with no flavor left. I would think you would eventually be diluting the vanilla by always adding more vodka if the beans themselves are no longer flavorful. Thanks! I have a bunch of recipes on the list this week. Can’t wait to make more desserts. Carol, I am about to use my 3 soaking of beans. The 2nd batch was fine. I think the older the beans are, maybe the longer they need to soak. I was just wondering how long the vanilla extract will last. Will it taste differently when it’s gone bad? Also, I just found your blog and am super happy I did. I have yet to try out a recipe but my husband and I have been trying to eat more low sugar/carb and it’s refreshing to find recipes and a website that doesn’t care about making things low fat as well. I just purchased your recipe book, thanks! I’m trying to determine the type of beans to use for splitting and scraping into recipes versus extract. I see grade A (wet, plump), B (in between) and “split”/dry. I’d like to have 30 to use for this recipe, and a few that are ideal for scraping into panna cotta, pudding, ice cream, etc. Which type is best for each purpose? Thanks!